The TRIAD 2005 cover was designed by the publications team and features a photograph of a path taken by HCC student, Jason Vega. The photo was manipulated in Photoshop CS by Chen Wang. Hillsborough Community College and The Triad Staff are proud to present the 2005 edition of The Triad, HCC’s Annual Features and Literary/Fine Arts magazine which focuses mainly on dynamic student works. 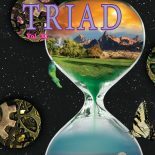 The Triad represents a cross-section of Fiction/Non Fiction stories, photography, and art with creativity that brings artists together to produce exemplary work. This year’s Triad focuses on the many different paths our students have traveled. We invite you to take a journey with us through hurricane Charlie, the trips to Africa and China, and all the poetry, short stories, photography, and art that our amazing students have created. I am so grateful to have had the opportunity to work on The Triad for my second and ﬁnal year as I am graduating from HCC with my Associate of Arts Degree. This year my goal was to encourage students to get involved with student publications. When I began my task I realized how many students did not even know we have a school magazine. I was blessed to have built a team of many of HCC ﬁnest, and we all had such a huge learning experience. From learning how to work as a team, making a very hard decision regarding all the wonderful submissions, learning new software while designing, and many other challenges. Although there were obstacles, they helped build our skills and will help us all in the future. I appreciate all of you who hung in there with me to the end. As I leave HCC a completely different person than when I arrived, I would like to thank all the people who encouraged me, inspired me, and supported me through many of my own different paths, through the good times and the bad. I would especially like to thank my daughter who was so patient with all the hours I spent working on the magazines. I will never forget this opportunity and continue to encourage students to get involved, it will change your life. To the readers, if these stories touch your lives half as much as they touched mine, it was worth every minute. President Kennedy’s quote reminds us to appreciate the freedom of expression; without this right, we would not have the ability to express our thoughts and our beliefs through poetry, ﬁction, non-ﬁction, photography, and art. Freedom is what makes all expression a form of truth. This year, HCC held a writing competition centered on women and feminine concerns. The winner, Yeatie Morgan, has been published, as well as a variety of poems, photographs, and paintings. The submitted works revealed a consistent and overall theme. The motif of a journey emerged through the works representing the pathways in the life of birth, childhood, human rights, travel, religion, and death. The journey evolves through features of non-ﬁction, ﬁction, and selected works of ﬁne art. Working on the Triad has been a wonderful experience, and I will forever treasure the Saturday meetings, powdered donuts, battles against disgruntle computers, and trains that stop trafﬁc. I wish to thank Michele Laws, Dr. Richard Gaspar, and Dr. Janiece Sumner-Kenaﬁck for their support and encouragement. I also want to thank my fellow staff members, and especially the contributors.